I live in Cheshire with my husband Mark. We have 8 children between us and a scruffy little dog called kitty. Mark works as a lecturer at Liverpool university and I am a support worker for the elderly with Dementia. Our families have always holidayed in Criccieth; our parents, and us as parents with our children. Mark & I married here in Criccieth, and when Ardro came up for sale, we knew it was the home for us. Mark's parents honeymooned 3 doors away from Ardro in 1947. Criccieth and it's way of life is in our blood. If your still in any doubt please check out our reviews. We benefit from the peace & tranquillity that comes with being by the sea in a town that has essentially remained unchanged for decades. Walking (or just sitting) on the beach replenishes the soul. Fishing from our sea kayak while dolphin watching cannot be beaten. Please note we charge a small amount for the use of the tumble dryer. Ardro has a fully equipped kitchen, which we feel is the hub of the house. It has all mod cons you would expect in your own kitchen at home. Although Ardro has full central heating throughout the house we have installed a wood burning stove. Large 49 inch plasma screen with DVD player and selection of DVDs. We have a large selection of family games in our game cupboard for you to use. We have a beautiful courtyard which catches the evening sun, where you'll find peace, warm and solitude. A great place for Al fresco dining. Check out our photos. 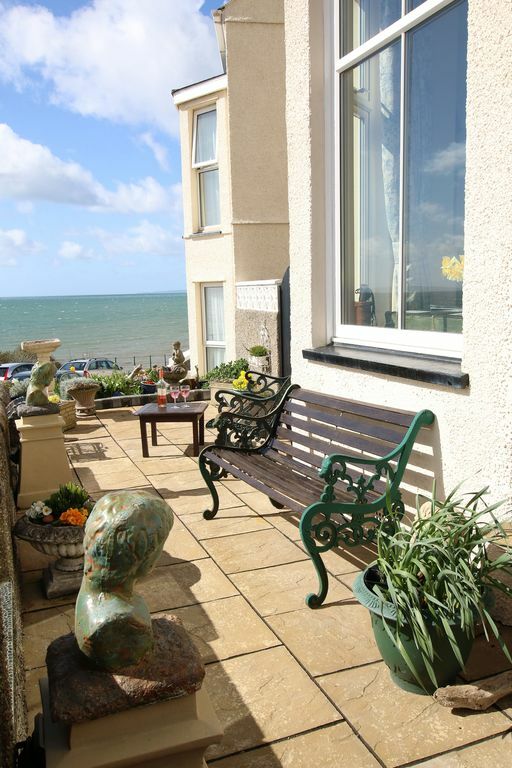 We have a beautiful front terrace that over looks the sea, where you can drink wine in the morning (?) watching the Dolphins or have hot chocolate watching the sunset. The nearest golf club is at Criccieth which is under 1 mile away and Porthmadog golf club only three miles away. Nefyn is one of the most picturesque gold clubs in the area and this is a 20 minute rive form the property. Harlech golf club is 30 minutes drive and well worth a try. This property is a Friday to Friday change over day. Although you may wish a mid week break so please contact us for more dates. We do have a strict cancellation policy, however we will consider a PART refund if you cancel within a week of booking the property. We were two couples and the house was perfect. The master suite looks over the sea and the castle--a perfect place to sleep, relax or have coffee. Plenty of bathrooms, closets, a large sitting room looking over the sea and a kitchen with everything we needed! We had a lovely week! Jane was very helpful, leaving excellent restaurant suggestions. The town is charming and easy to navigate. Everyone in our party was fit so the 3 story layout suited us just fine. I wouldn't recommend the house for anyone who has trouble with stairs, however. With the kitchen and dining on the ground floor and sitting room and 2 bedrooms & shower/bath on the first floor (American 2nd), the stairs might be a problem. We loved our week here and highly recommend the house to active adults and families! We were given a warm welcome and shown around the house, and there was a lovely selection of treats left for us too. The house is clean and well maintained, and stocked with everything you need. The owners use it regularly for family get-togethers so it feels homely. The location is perfect - right next to the beach, just a little elevated. Also next to the castle and the town. You can walk to a surprisingly well- stocked garage for grocery requirements, and there are supermarkets a short drive away. We were even treated to the magical sight of dolphins one evening, swimming very close to the shore for around 15 minutes or more. The house has several pairs of binoculars, but really the view is just beautiful without them. Wifi was good throughout the house. A perfect holiday home for our two families (4 adults, children 15,14,12,11). We hired this house for 7 friends to holiday in Wales - and it was perfect. Such a great base for exploring the local area. The house itself is so beautifully presented and very well stocked with everything you could need for a holiday! We arrived in driving rain, but were very welcomed by the owners. We have stayed in many VRBO's, but this was the best experience. The hosts met us on site, provided us with a welcome pack and even had the kettle on. The house is fantastic, plenty of room and very well maintained. It was perfect for our group of 8, 6 adults and 2 children. If the weather is nice, you can sit out front and watch for dolphins. We wish we could have stayed longer! We had a wonderful stay at Ardro - the house is lovely with beautiful sea and castle views, ideally placed for beaches and town centre. Jane is extremely organised and welcoming and the house is spacious and very well furnished. The town has several restaurants, pubs and cafes along with an excellent fish and chip shop and ice-cream parlour. I would recommend the property to anyone looking for a relaxing holiday. Thank you Kate for a lovely view, we are so pleased you had a relaxing break and hope to see you all again soon. This is the ideal base for exploring the mountains and beaches of Snowdonia. Criccieth town is a 5 minute walk down the hill. Porthmadog marina and Pwllheli are a short drive. The Italiante Village of Portmeirion is a 15 minute drive away from Ardro. Fishing can be organised on your behalf if you require. Why not try the biggest fastest zip wire based in Penrhyn Quarry, Bethesda which is 20 minutes away from Criccieth. If that's a bit on the wild side you could try go karting at Glasfryn a 15 minutes drive from Criccieth. 50 m walk from our front door is a sandy beach, or Black Rock Beach with it's huge sandy bay is a 5 minute drive away from Ardro. The stunning beaches of the LLlyn Peninsula are on your doorstep. Abersoch, Nefyn are within easy reach of Criccieth. The nearest airports are Liverpool and Manchester. The nearest ferry port is at Holyhead on the island of Anglesey. Criccieth train station is a 5 minute walk form the property. You wont have to travel far. Shop local we have a lovely selection of shops including, bakery, fruit and veg shop, post office, office licence, florist. If you like eating out we have a large selection of restaurants and pubs to tingle any taste bud! If you need you need a large supermarket we have Tescos at Portmadog, Aldi in Portmadog and Asda in Pwllhel. Booking Notes: A 20% deposit is taken at the time of booking with the balance payable eight weeks prior to arrival. We ask for a cautionary £200.00 deposit against breakages and additional cleaning charges. Please note the service fee is paid to Owners direct and not to the owners. IF YOU WISH NOT TO PAY OWNERS DIRECT A SERVICE FEE PLEASE PHONE THE OWNERS BEFORE BOOKING. The service fee is paid by the traveller when booking through the HomeAway websites. This fee covers the cost of providing 24/7 customer support. you can contact the owners anytime on 01928 590450 or email Jane.pinnington@aol.com Changeover Day: Change over is normally Saturday to Saturday. Arrive 3.30 and leave the following Saturday at 10.00 am. We are flexible on change over days and times so please ask. Notes on prices: We offer mid week breaks( Sunday - Thursday) and weekend breaks. For 2 people to 8. Please feel free to call for more information. Our weekend breaks are generally £300- £350.00 per night depending on the season.